Attar, Ramtin, et al. "Embedded Rationality: A Unified Simulation Framework for Interactive Form Finding." International Journal of Architectural Computing 8.4 (2010): 399-418. This paper describes embedded rationality as a method for implicitly combining fabrication constraints into an interactive framework for conceptual design. 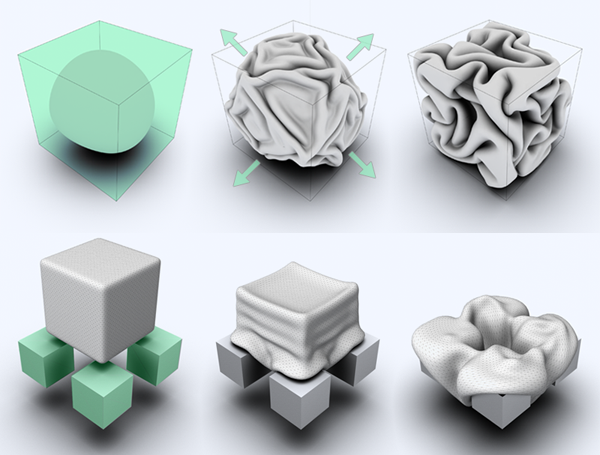 While the concept of ‘embedded rationality’ has been previously discussed in the context of a parametric design environment, we employ this concept to present a novel framework for dynamic simulation as a method for interactive form-finding. By identifying categories of computational characteristics, we present a unified physics-solver that generalizes existing simulations through a constraint-based approach. Through several examples we explore conceptual approaches to a fixed form where the resulting effects of interacting forces are produced in real-time. Finally, we provide an example of embedded rationality by examining a constraint-based model of fabrication rationale for a Planar Offset Quad (POQ) panelization system.